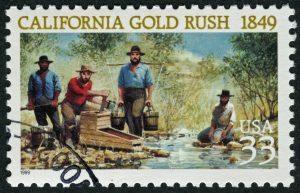 All told, an estimated 300,000 people are thought to have ventured to California to try to make their fortune during the gold rush. This mass migration is responsible for transforming California from a scarcely populated western outpost to an officially recognized American state. Gold seekers came not only from all over the US, but from South America, China, and many other foreign lands as well. The 49ers arrived by a variety of conveyances, including covered wagons and ocean-going ships. After the vehicles were abandoned, they were torn apart so the wood, nails, and other materials could be used to construct the shops, hotels, and other buildings in the towns and cities beginning to spring up in the area. The best year for mining gold was 1852, when some $80 million worth of the precious metal was said to have been found by prospectors. This occurred at a time when all California land was considered public property, and therefore claims and gold discoveries were not subject to federal taxes or fees of any kind. The largest single year haul belonged to brothers John and Daniel Murphy, who reportedly discovered and mined $1.5 million of gold in the early days of the rush. In today’s money, the brothers’ take would total more than $40 million. The real winners in the gold rush were merchants (such as Levi Strauss), bankers, food distributors, and other service providers who made their fortunes catering to the daily needs of the prospectors. The gold rush might have ended long ago, but its legacy lives on in everything from California’s statehood to Levi’s jeans to San Francisco’s football team nickname. The legacy also endures in our general appreciation of gold as a valuable commodity that protects our wealth in the midst of economic uncertainty.